Beautifully Simple, Functional and QUICK to install. Planks are suitable for normal wall and ceiling conditions and are supplied T&G with a concealed fastening clip that requires no machining or measuring. 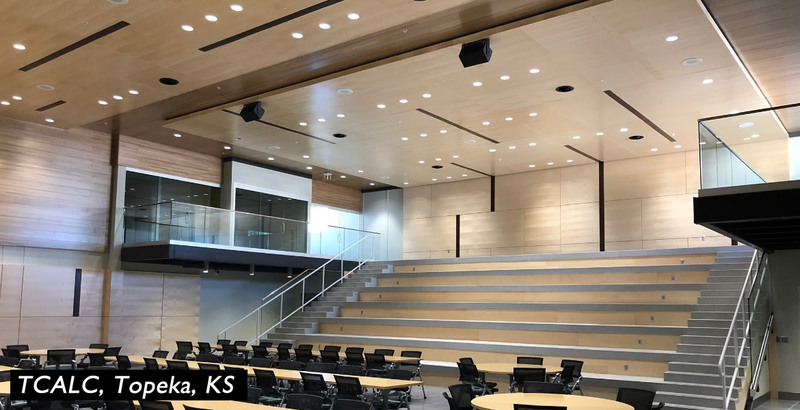 Planks are available as acoustical or standard in both Real Wood Veneer or Carbon Zero HPL®. Because the Planks require no machining they are simply cut to length on site, and when installed in a traditional pattern are virtually waste free delivering maximum yield. Planks are made from MDF with impact resistant HPL or Real Wood veneer as standard. Concealed stainless steel fasteners are supplied with each plank to make installation on either the wall or ceiling a breeze. Enhancements such as Class 'A' Veneers or HPL's and Class 'A' or Moistiure Resistant substrates can up the performance factors to cope with more demanding environments. Acoustic planks can be either perforated or slotted and come complete with acoustical fleece backers. Planks are available in Real Wood Veneer and Carbon Zero HPL®. Custom Digital designs can be developed in house. Projection is 1/4" (6mm) and standard plank thickness is 3/4" (18mm) for a 1" (24mm) overall depth. Custom color substrates are also available to enhance long edge joints between planks.